Received December 2, 2008; Accepted January 12, 2009. 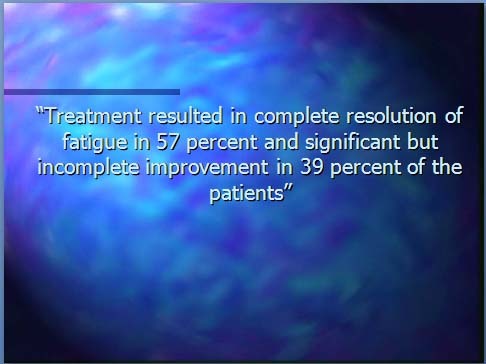 This study aims to improve the health of patients suffering from chronic fatigue syndrome (CFS) by interventions based on the biochemistry of the illness, specifically the function of mitochondria in producing ATP (adenosine triphosphate), the energy currency for all body functions, and recycling ADP (adenosine diphosphate) to replenish the ATP supply as needed. Patients attending a private medical practice specializing in CFS were diagnosed using the Centers for Disease Control criteria. 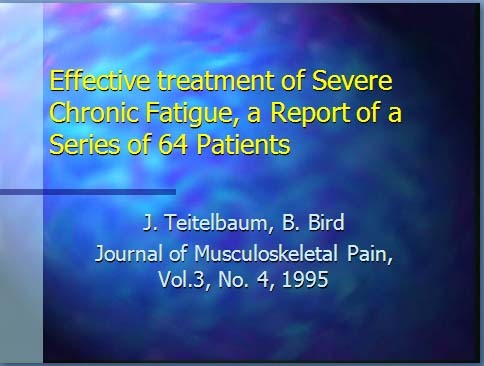 In consultation with each patient, an integer on the Bell Ability Scale was assigned, and a blood sample was taken for the “ATP profile” test, designed for CFS and other fatigue conditions. Each test produced 5 numerical factors which describe the availability of ATP in neutrophils, the fraction complexed with magnesium, the efficiency of oxidative phosphorylation, and the transfer efficiencies of ADP into the mitochondria and ATP into the cytosol where the energy is used. With the consent of each of 71 patients and 53 normal, healthy controls the 5 factors have been collated and compared with the Bell Ability Scale. The individual numerical factors show that patients have different combinations of biochemical lesions. When the factors are combined, a remarkable correlation is observed between the degree of mitochondrial dysfunction and the severity of illness (P<0.001). Only 1 of the 71 patients overlaps the normal region. The “ATP profile” test is a powerful diagnostic tool and can differentiate patients who have fatigue and other symptoms as a result of energy wastage by stress and psychological factors from those who have insufficient energy due to cellular respiration dysfunction. The individual factors indicate which remedial actions, in the form of dietary supplements, drugs and detoxification, are most likely to be of benefit, and what further tests should be carried out. Chronic Fatigue Syndrome (CFS) is a multisystem illness that robs its victims of their health and their dignity. Two of the most characteristic and debilitating signs of CFS are very poor stamina and delayed post-exertional fatigue. Sometimes the fatigue is mainly mental, and sometimes mainly physical. Fatigue is the same as lack of energy and energy comes from the basic metabolic process of the oxidation of food. A widely-held hypothesis (A) is that the metabolism of people with CFS is normal, but the fatigue and other symptoms are due to psychological factors. It is acknowledged that physical fatigue is lack of energy, but mental fatigue is considered to be a subjective sensation characterized by lack of motivation and of alertness , even though the brain is a major consumer of resting cellular energy. 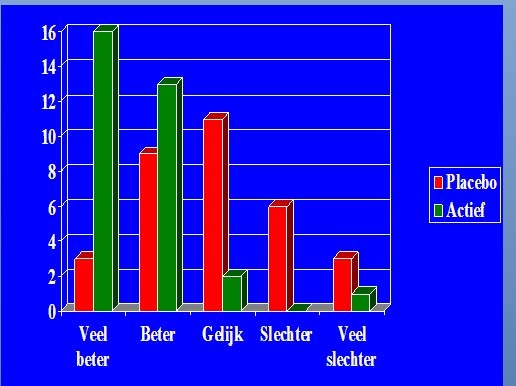 Patients may demonstrate negative illness beliefs that increase the severity of the symptoms [2, 3]. However, if the metabolism is functioning properly, the fatigue and related symptoms must be due to energy being wasted by the mental and physical processes of stress, anxiety, tension and depression. Patients should be able to be helped, possibly cured by psychological intervention, e.g. cognitive behavioural therapy. In order to explain the post-exertional malaise an ancillary hypothesis (A′) is needed, namely deconditioning due to disuse of muscles. However, hypothesis A′ is not supported by experiment in many cases as we will see below. An alternative hypothesis (B) is that there is a metabolic dysfunction with the result that not enough energy is being produced. The main source of energy comes from the complete oxidation of glucose to carbon dioxide and water. The digestive system produces glucose, glycerol and fatty acids, and amino acids. If there is a problem with the digestive system, e.g. gut fermentation, hypochlorhydria or pancreatic insufficiency, energy production will be impaired and fatigue may result . These conditions can and should be tested for. Allergies and thyroid malfunction can also produce fatigue. When the digestive system is functioning properly glucose and lipids are fed into the blood stream where, together with oxygen bound to hemoglobin in erythrocytes (red blood cells), they are transported to every cell in the body. In the cytosol of each cell glucose is broken down in a series of chemical reactions called glycolysis into two molecules of pyruvate which enter the energy-producing organelles present in most cells of the body, the mitochondria. Some structural details and the number of mitochondria per cell are dictated by the typical energy requirements; cardiac and skeletal muscle cells and liver and brain cells contain the highest numbers. The mitochondria generate energy by oxidative metabolism in the form of ATP (adenosine triphosphate) which when hydrolysed to the diphosphate, ADP, releases energy to produce muscle contractions, nerve impulses and all the energy-consuming processes including the chemical energy needed to synthesise all of the complex molecules of the body [5, 6]. 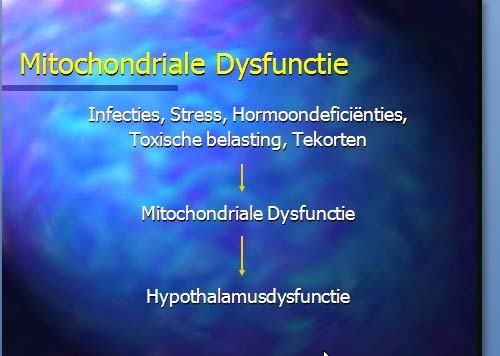 Thus, mitochondrial dysfunction will result in fatigue and can produce other symptoms of CFS. The two hypotheses are not mutually exclusive. Some patients may satisfy both. However there are constraints; the basal metabolic rate (about 7000 kJ per day) must be maintained and the first law of thermodynamics must not be violated. 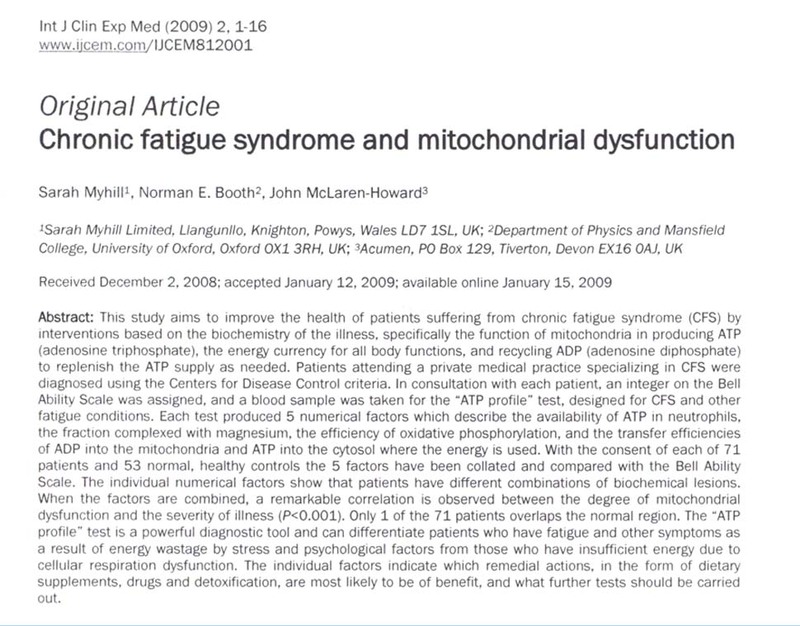 There is considerable evidence that mitochondrial dysfunction is present in some CFS patients. Muscle biopsies studied by electron microscopy have shown abnormal mitochondrial degeneration [7-9]. Biopsies have also found severe deletions of genes in mitochondrial DNA (mtDNA), genes that are associated with bioenergy production [9, 10]. One consequence of mitochondrial dysfunction is increased production of free radicals which cause oxidative damage. Such oxidative damage and increased activity of antioxidant enzymes has been detected in muscle specimens . Some essential compounds (carnitine and N-acylcarnitine) needed for some metabolic reactions in mitochondria have been measured in serum and found to be decreased in patients with CFS [12, 13]. 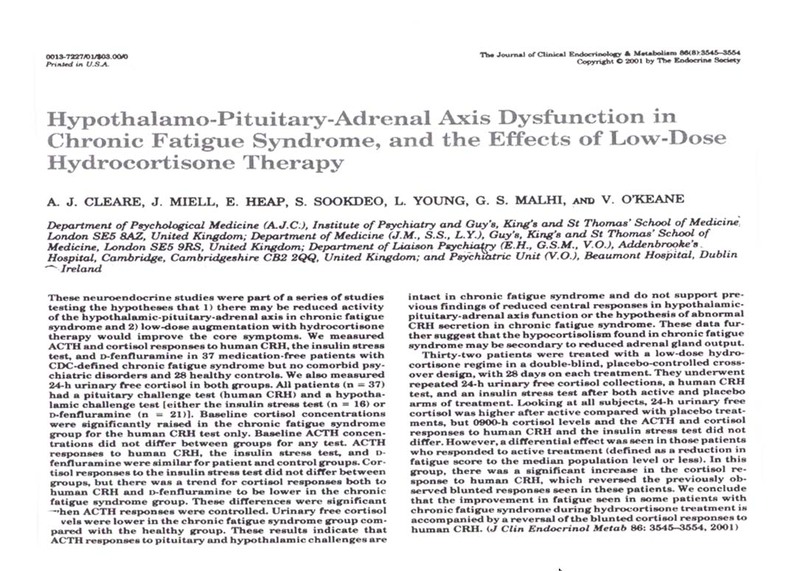 Both studies found that the carnitine levels correlated with functional capacity. Reduced oxidative metabolism [14-16] and higher concentrations of xenobiotics, lactate and pyruvate  have been reported. In one group of patients a decrease of intracellular pH after moderate exercise was observed and a lower rate of ATP synthesis during recovery was measured . These findings suggest impaired recycling of ADP to ATP in the mitochondria. 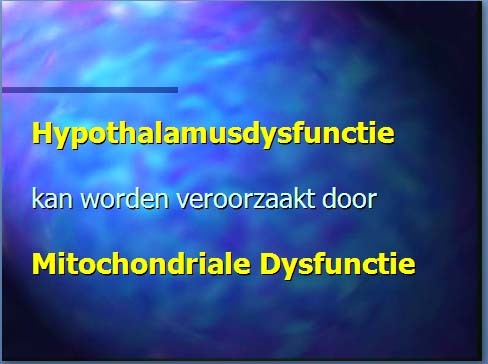 Hypothesis B is attractive because mitochondrial dysfunction in various organs offers possible explanations for many of the other symptoms of CFS and ME. There is mounting evidence that the symptoms are due to dysfunctions on the cellular level. Abnormalities have been seen in immune cells , and gene expression studies have revealed abnormalities in genes associated with immune cells, brain cells, skeletal muscle cells, the thyroid, and mitochondria [27, 28]. A further genetic study identified seven clinical phenotypes . There seem to be three distinct clusters of clinical abnormalities that define CFS : (a) blood flow and vascular abnormalities such as orthostatic intolerance (vascular system), (b) widespread pain, and high sensitivities to foods, temperature, light, noise and odours (central nervous system sensitization), and (c) fatigue, exhaustion and brain fog (impaired energy production). Hypothesis B is that the lack of energy in the third cluster originates in the mitochondria of individual cells. But mitochondrial dysfunction can also produce abnormalities (a) and (b) because ATP produced in each cell by its mitochondria is the major source of energy for all body functions. These observations from biomedical research into CFS are very encouraging, but how long do patients have to wait before there is some real progress in ameliorating their symptoms? In a private medical practice which specializes in CFS the primary goal is to make the patients feel and function better. Treatment is started by making use of the existing biomedical knowledge to provide a basis of nutrition, lifestyle management and pacing. Thyroid, adrenal and allergy problems are also addressed if they occur. Most patients improve with these interventions. However, in many cases the improvement is not as great as the patient and doctor would like. 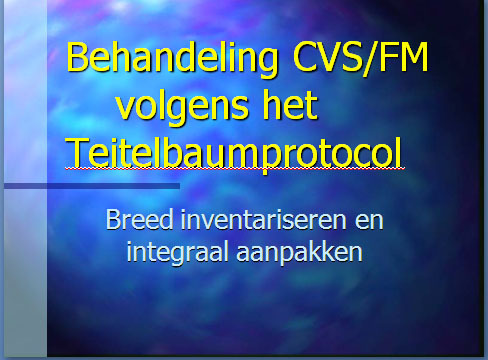 When one of us (SM) became aware of the commercial “ATP profile” testing package it was thought that this might be useful in predicting the level of disability and identifying any biochemical lesions that were at fault. The “ATP profile” testing package, developed by one of us (JMH), is designed specifically for CFS and other conditions where energy availability is reduced. It was found early on that the “ATP profile” was very useful in predicting the level of disability and suggesting the most likely interventions which would benefit patients. Tests have now been carried out on a number of patients and also on normal, healthy subjects. When collated the test results show features that were completely unexpected. Before we report here on the test procedures and results we provide a brief summary of how mitochondria produce energy. In each cell glucose is broken down to pyruvate with the production of some ATP (2 molecules net per molecule of glucose). The pyruvate and also fatty acids enter the mitochondria of each cell, shown schematically in Figure 1, where two coordinated metabolic processes take place: the tricarboxylic acid (TCA) cycle, also known as the Krebs' citric acid cycle, which produces some ATP, and the electron transport chain (ETC, also called the Respiratory Chain because it uses most of the oxygen we breathe in) which regenerates ATP from ADP by the process of oxidative phosphorylation (ox-phos). Altogether some 30-odd molecules of ATP are produced per molecule of glucose and these constitute the main cellular energy packets used for all life processes. As well as food and oxygen the metabolic pathways require all the nutrients involved in the production of the large number of enzymes which control the many biochemical reactions involved and all the cofactors needed to activate the enzymes [31-33]. Most of the enzymes are coded by nuclear DNA (nDNA) in the cell's nucleus and a few are coded by mtDNA. Some of the enzymes rely on other organs. For example, thyroid hormone is needed in the TCA cycle. On the other hand hyperthyroidism can uncouple the ox-phos process , so a thyroid problem can lead to fatigue and this can be tested for. The human body contains typically less than 100 g of ATP at any instant, but can consume up to 100 kg per day. Thus the recycling ox-phos process is extremely important and it produces more than 90% of our cellular energy. The main features and processes are illustrated in a simplified form in Figure 1 (further details can be found in all college-level textbooks on biochemistry, e.g. , and in secondary school advanced-level biology textbooks, e.g. ). The ETC culminates with the protein complex ATP synthase which is effectively a reversible stepping motor in which 3 ATP molecules are produced from ADP and inorganic phosphate (Pi) every revolution . Because of evolutionary history ATP is made inside the mitochondrial inner membrane but used outside in the cytosol where it releases energy by converting to ADP and Pi. The Pi as a negative ion is co-transported back inwards together with H+, while ADP3− is transported inwards through the Translocator protein adenosine nucleotide translocase (TL or ANT) in exchange for ATP4− moving out into the cytosol. There are potential problems here because it is known that some specific molecules (e.g. atractyloside) block the transfer inwards and certain others can block transfer outwards , and there is the possibility that there may be other molecules including environmental contaminants which can block transfers. Main stages and location of energy metabolism in a human cell (left), and simplified details of a mitochondrion showing the main metabolic cycles and the oxidative phosphorylation respiratory chain (right). The outer mitochondrial membrane is highly permeable whereas the inner membrane is permeable only to water and gases. Special carrier and Translocator proteins pass reactants through it. At the top are the proteins involved in the respiratory electron transfer chain (ETC) and in the transfer of ATP and ADP between the cytosol and mitochondrion. ADP and Pi are combined by ATP synthase to make ATP. The ADP/ATP Translocator opens OUT to transfer ADP into the matrix and opens IN to transfer ATP to the cytosol. Nicotinamide adenine dinucleotide plays a key role in its oxidised form NAD+ and its reduced form NADH + H+ in carrying and transferring protons (H+) and electrons (e−). Adapted from:  and . What happens if some part of these cellular metabolic pathways goes wrong? If the mitochondrial source of energy is dysfunctional many disease symptoms may appear  including the symptoms of CFS. Suppose that the demand for ATP is higher than the rate at which it can be recycled. This happens to athletes during the 100 meters sprint. The muscle cells go into anaerobic metabolism where each glucose molecule is converted into 2 molecules of lactic acid. This process is very inefficient (5.2% energy production compared to the 100% of complete oxidation) and can last for only a few minutes. The increased acidity leads to muscle pain. Also, when the concentration of ADP in the cytosol increases and the ADP cannot be recycled quickly enough to ATP, another chemical reaction takes place. This becomes important if there is any mitochondrial dysfunction. Two molecules of ADP interact to produce one of ATP and one of AMP (adenosine monophosphate). The AMP cannot be recycled  and thus half of the potential ATP is lost. This takes some days to replenish and may account for the post-exertional malaise symptom experienced by patients [39-43]. Thus, mitochondrial dysfunction resulting in impaired ATP production and recycling is a biologically plausible hypothesis, and there is considerable evidence that it is a contributory factor in CFS, at least for a subset of patients. Our study may be considered to be a test of this hypothesis. Seventy-one patients, 54 female of average age 47 (range 14 to 75) and 17 male of average age 52 (range 20 to 86), were selected from a total of 116 consecutive patients attending a private medical clinic specializing in CFS/ME. 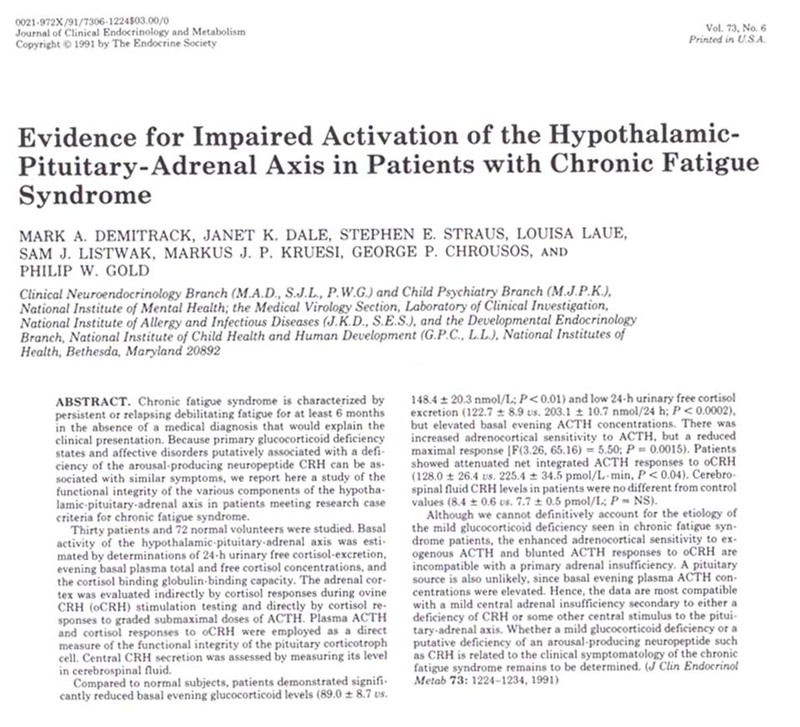 Patients were excluded only if they did not meet the CDC diagnostic criteria for CFS  or if the “ATP profile” test had been made before they had been seen clinically. Evaluations, tests and interventions, where appropriate, were carried out for diet and sleep problems, allergies, and thyroid and adrenal problems. Advice on pacing was also given. After this stage a meeting was held with each patient at which an agreed numerical Ability was assigned and recorded in the clinical notes. The integral CFS Ability Scale  runs from 0 to 10 and is given in Appendix A. It was proposed to those patients who had not improved to an acceptable clinical level after these interventions that they have the “ATP profile” test done. All the participating patients had scores of 7 or less on the CFS Ability Scale. The nature of the test was explained and each patient agreed (and paid) for the “ATP profile” test (needing a 3-ml venous blood sample) to be performed. The laboratory carrying out the tests (Biolab Medical Unit, www.biolab.co.uk) was blinded to the Ability associated with any blood sample. As tests were carried out on more patients, it became clear that the “ATP profile” results were providing helpful information, and patients were asked to give written, informed permission for their test data to be used anonymously. All patients have done this. Blood samples from fifty-three normal, healthy volunteers were obtained by one of us (JMH) as Laboratory Director of Biolab until retirement from that position in 2007. Biolab obtained written permission with informed consent from each volunteer. The samples from the patient group and the normal (control) group were processed in the same way. The control group consisted of 40 females of average age 36 (range 18 to 63) and 13 males of average age 35 (range 18 to 65). For both groups all procedures were consistent with the Declaration of Helsinki (2000) of the World Medical Association (www.wma.net) and this report follows the guidelines of the International Committee of Medical Journal Editors (icmje.pdf available at www.icmje.org). ATP is present in cells mainly as a complex with magnesium and is hydrolysed to the diphosphate (ADP) as the major energy source for muscle and other tissues. ADP conversion to ATP within mitochondria can be blocked or partially blocked by some environmental contaminants. Specifically, the TL in the mitochondrial membrane that controls the transfer of ADP from the cytosol and ATP to the cytosol may be chemically inhibited and its efficiency is also pH dependent. Changes in acid:base balance, magnesium status, and the presence of abnormal metabolic products can have similar effects to xenobiotic inhibition of the TL. A number of methods have been developed for assaying ATP. Methods such as magnetic resonance spectroscopy (MRS) of 31P require the patient to be at a facility which is available only at major hospitals or research institutes. Biopsies of skeletal muscles can be taken, but not of vital organs such as the heart, brain or liver. Methods using blood samples (specifically neutrophils) are relatively non-invasive and are amenable to routine testing. In addition the blood stream reaches almost every cell in the body and carries much information concerning what is going on. The method of measuring ATP used in the “ATP profile” dates from 1947 when McElroy poured a solution of ATP onto ground-up firefly tails and observed bright luminescence and found that the amount of light produced was proportional to the ATP concentration . Thus he showed that the energy contained in ATP can produce light and this led the way to the development of bioluminescent measurements which can be carried out routinely and reproducibly with commercially available biochemical assay kits and bioluminescence equipment [46-49]. Light is produced when ATP reacts with D-luciferin and oxygen in the presence of Mg2+ and the enzyme luciferase. When ATP is the limiting reagent, the light emitted is proportional to the ATP present. ATP concentration in the neutrophils is measured in the presence of excess magnesium which is needed for ATP reactions. This gives the factor ATP in units of nmol per million cells (or fmol/cell), the measure of how much ATP is present. Then a second measurement is made with just endogenous magnesium present. The ratio of this to the one with excess magnesium is the ATP Ratio. This tells us what fraction of the ATP is available for energy supply. The efficiency of the oxidative phosphorylation process is measured by first inhibiting the ADP to ATP conversion in the laboratory with sodium azide. This chemical inhibits both the mitochondrial protein cytochrome a3 (last step in the ETC) and ATP synthase . ATP should then be rapidly used up and have a low measured concentration. Next, the inhibitor is removed by washing and re-suspending the cells in a buffer solution. The mitochondria should then rapidly replete the ATP from ADP and restore the ATP concentration. The overall result gives Ox Phos, which is the ADP to ATP recycling efficiency that makes more energy available as needed. The TL switches a single binding site between two states. In the first state ADP is recovered from the cytosol for re-conversion to ATP, and in the second state ATP produced in the mitochondria is passed into the cytosol to release its energy. Measurements are made by trapping the mitochondria on an affinity chromatography medium. First the mitochondrial ATP is measured. Next, an ADP-containing buffer is added at a pH that strongly biases the TL towards scavenging ADP for conversion to ATP. After 10 minutes the ATP in the mitochondria is measured. This yields the number TL OUT. This is a measure of the efficiency for transfer of ADP out of the cytosol for reconversion to ATP in the mitochondria. In the next measurement a buffer is added at a pH that strongly biases the TL in the direction to return ATP to the cytosol. After 10 minutes the mitochondria are washed free of the buffer and the ATP remaining in the mitochondria is measured and this gives the number TL IN. This is a measure of the efficiency for the transfer of ATP from the mitochondria into the cytosol where it can release its energy as needed. Figure 2 shows scatter plots (a point for each patient) of each of the 5 factors vs. CFS Ability. As we will see later it is convenient to divide the data from the 71 patients into 3 categories, “very severe”, “severe”, and “moderate”, which have about the same number of entries (25, 21, and 25). To the right of each scatter plot we show a stacked projection histogram for the 3 categories of Ability, and at the far right a histogram for the normal controls. Looking first at the ATP histogram for the normal controls we see a well defined minimum value with a long tail up to a maximum value of 2.89 fmol/cell. The average value is 2.00 ± 0.05 (SEM (Standard Error of the Mean), n=53) which can be compared with the measurement, 1.9 ± 0.1 (SEM, n=12), made some 25 years ago by the same technique in a study of the energetics of phagocytosis in neutrophils . The stacked histogram for the patients and the Ability plot clearly show that some patients are in the normal region and some are below and they split into two groups with very little overlap. Rather than comparing the patients with the average of the normal control group which is customary, we prefer to compare with the minimum value of the control group which is more cleanly defined. Also, this method permits us to classify patients as being in the normal region or being below the normal region. Clearly this can be changed easily and all the numbers are given in Figure 2. We therefore show as a heavy horizontal dashed line the minimum value of each factor measured for the controls. Scatter plots of the 5 factors (A to E) measured in the “ATP profile” test vs. CFS Ability. In the middle are stacked projection histograms of the 3 categories of the patient group, and on the right projection histograms of the control group. The heavy horizontal dashed lines correspond to the minimum value of each factor measured for the control group. Figure 2A, ATP vs. CFS Ability, shows that the majority of the “very severe” and “severe” patients are below the normal minimum but very few are below 75% of this minimum. Note that 3 of the “very severe” patients are well into the normal region; they have problems with one or more of the 4 other factors. Just over 50% of the “moderate” patients are in the normal region. There is a small positive correlation which is indicated by the “trend” crosses. There is not a gentle increase in ATP with Ability, but an increase in the fraction of patients above the normal minimum line. Figure 2B shows ATP Ratio vs. CFS Ability. The majority of patients in all 3 categories are below the normal minimum, and about 1/3 of “moderate” patients are below 75% of the normal minimum. The correlation with Ability is slightly negative. Values for the normal controls are rather tightly grouped with a minimum of 0.65 and average of 0.69. The Ox Phos plot in Figure 2C shows a wide range of values and a strong positive correlation for this factor for the patient group. The stacked projection clearly shows that there are two groups – above and below the normal minimum and the upper group spans a similar range to the controls. 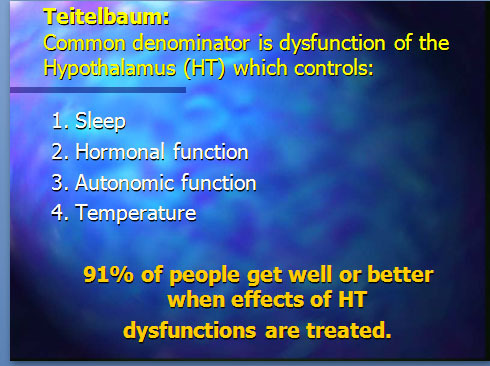 Note the high value for the sole patient with CFS Ability = 0. This patient also has ATP = 1.26 and ATP Ratio = 0.59 which are not very far below the normal minima. The TL OUT plot of Figure 2D also shows two groups with a rather sharp peak in the stacked projections just above the normal minimum and this closely matches the projection of the control group. Many patients, particularly the “very severe”, are far below the normal minimum. The TL IN plot of Figure 2E also has a peak in the normal region. 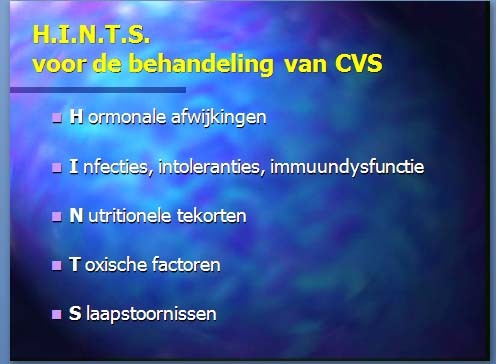 However, some patients have very low values, including the patient with CFS Ability = 0. The product TL OUT × TL IN is only 0.012 for this patient who is very severely ill whereas this product is 0.17 at the normal minima, a factor of 14 larger. If just ATP or Ox Phos had been measured the very severe mitochondrial dysfunction of this patient would not have been detected. Note the strong positive correlation for TL IN. Most patients are below normal in more than one factor (average [range] is 3.7 [2 to 5] for “very severe”, 3.5 [2 to 5] for “severe” and 2.2 [1 to 4] for “moderate”). Some of the features are summarised numerically in Table 1. For most of the factors the percentage of patients who are in the normal region increases in going from “very severe” to “severe” and to “moderate”. The exception is the ATP Ratio which gently decreases, but within the statistical errors is constant. Both TL IN and the product TL OUT × TL IN increase by large factors. For patients in the “moderate” category the main influence on their illness appears to be the ATP Ratio. Table 1 also illustrates the importance of measuring more than one factor. For example, if only ATP had been measured, 28% of all the patients would be classified as normal, and if only Ox Phos had been measured, 32% of the “very severe” patients would be classified as normal. It is also helpful to look at correlations between pairs of numerical factors. The five most relevant examples are shown in Figure 3. Scatter plots of correlations between pairs of factors measured in the “ATP profile”. In the scatter plots of Figure 3 the normal region is the rectangular region in the upper right corner defined by the normal minima dashed lines. In the ATP Ratio vs. ATP plot (Figure 3A) most patients are fairly close to the normal region apart from the small cluster at ATP Ratio ~ 0.35. In the Ox Phos vs. ATP plot (Figure 3B) there are only a few patients, all “moderate”, in the normal region for both factors. Some of the “very severe” and “severe” patients are in the normal region for Ox Phos and some are far below. Note the apparent negative correlation for the normal controls. This shows that for normal subjects there is a compensatory mechanism, i.e. if ATP is high Ox Phos is low and vice versa. This is expected because the ATP concentration is a major factor in the control of the rate of the ox-phos process and the energy supply is adjusted to meet the energy demand. There is no obvious evidence for this effect in the patient group. In the Ox Phos vs. TL OUT plot (Figure 3C) only 6 (all “moderate”) patients are in the normal region of both factors. Note that as a function of TL OUT there are 2 groups, a distinct narrow band to the right of the vertical dashed line and a spread-out group to the left of this line. Looking vertically, note that for the first group the Ability of patients (indicated by the 3 categories) is correlated with their value of Ox Phos. There is a large spread in this factor and again there appears to be two groups roughly divided by the horizontal normal minimum line. Some of the patients in all 3 categories are above this line, but they have problems with one or more of the other factors. Some of the “very severe” patients have Ox Phos lower than the normal minimum by an order-of-magnitude. In the Ox Phos vs. TL IN plot (Figure 3D) there are many more patients in the normal region for both factors, but also many with very low values of one or both factors. In the TL IN vs. TL OUT plot (Figure 3E) there are two clusters, one in the upper right corner which is the normal region for both factors, and another well below it at TL IN ~ 0.1. Several patients are far below the normal minimum for both factors. In the biochemical methods used we might expect some correlation between the TL factors and Ox Phos because they are closely coupled and interacting parts of the ADP to ATP reconversion cycle. However, the plots indicate that the biochemical methods used can separate the Ox Phos and TL factors and measure them individually. To our knowledge this is the first time that such detailed effects have been observed. The biochemical measurements in the “ATP profile” separate the energy generation and recycling processes into 5 steps. As in any multistep process, for example electrical power production or an assembly line, the efficiency of the overall process is the product of the efficiencies of the individual steps. Any suggestion of relative weighting is irrelevant; it only results in an overall normalization factor. The product of ATP and ATP Ratio is the cellular concentration of ATP complexed with magnesium and this is the available energy supply of ATP. Ox Phos is the efficiency of the ETC which converts ADP into ATP. However, for the recycling of ADP to make more energy available the Translocator protein must efficiently have its binding site facing out to collect ADP (TL OUT) and alternately facing in (TL IN) to efficiently transmit ATP from the mitochondria into the cytosol where its energy can be used. We have found it useful to calculate the product of the five factors, the overall mitochondrial energy-producing relative efficiency, and call it the Mitochondrial Energy Score. We just multiply the 5 factors together for each patient and each control. The minimum value for the controls is 0.182 fmol/cell. We have chosen this as our normalisation point so we divide all the Energy Scores (for both patients and controls) by this value. Thus all controls have Mitochondrial Energy Score ≥ 1.00. A scatter plot of the Energy Score for each patient at each value of CFS Ability and each control is shown in Figure 4A. The horizontal dashed line indicates the minimum value for the normal controls and this is our normalization value of 1.00. Only one of the 71 patients has an Energy Score > 1 (namely 1.25 for one of the patients with Ability = 7). However this patient has 2 of the 5 factors below the normal minima. The Mitochondrial Energy Score. A. The Energy Score plotted against CFS Ability with a point for each patient. A point for each control is plotted at CFS Ability = 10. The horizontal dashed line at Energy Score = 1.00 is our normalisation at the minimum Energy Score for controls. Also shown is the best straight line fit to the patient data. B. The Energy Score plotted vs. Age of patients and controls. Note the high degree of correlation between Energy Score and CFS Ability and this is independent of where the mean or minimum of normal subjects is. 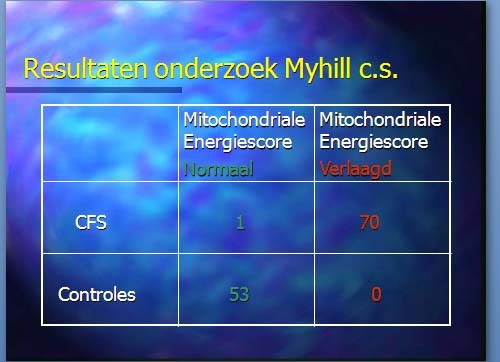 It is natural to believe that the CFS Ability of patients is more likely to depend upon mitochondrial dysfunction than vice versa, so we should really plot CFS Ability vs. Energy Score. However, the Ability was measured first, and Figure 4A shows convincingly that mitochondrial dysfunction is a major risk factor, and this has not been demonstrated before. Also shown in Figure 4A is the best straight line fit to all 71 entries. The fit is good, but there is no reason that the relationship should be a straight line. Table 2 gives the parameters of the fit. The Standard Error in the slope of the fitted straight line is so small that the probability P of the null hypothesis (i.e. that the slope is zero) is extremely small, P <0.001, when computed from the Student's t-distribution . The 99.9% confidence interval is 0.092 < β < 0.174 where β is the true slope and this lower limit is still several Standard Errors above zero. In Figure 4B the Energy Scores are plotted as a function of the age of each participant. It is believed that mitochondria play a major role in the aging process [31, 33] so there is the possibility that the younger mean age of the control group as compared to the patient group may influence our results. We have looked at the age dependence of all 5 factors and see no effect, and this is not surprising in view of the wide spread in values of each factor. The Energy Score is a more reliable measure of mitochondrial dysfunction. In Figure 4B there is no evidence for age dependence in the control group but the maximum age is only 65 years (points for three controls have been omitted because their Energy Score is more than 2.00 with a maximum of 2.83). There are six patients of age > 70, one “very severe” with Ability = 2, one “severe” with Ability = 3, and four “moderate” who all have Ability = 4. These four patients have Energy Scores which are below the average (0.42) for this Ability so there may well be a decrease with increasing age. On the other hand there is a 33-year old patient who also has Ability = 4 and is well below the average. Excluding the six patients of age ≥ 70 slightly improves the straight line fit R2 = 0.677) but has negligible effect on the other parameters or our conclusions. The “ATP profile” results indicate mitochondrial dysfunction of the neutrophils in the patients in our cohort, and moreover the degree of dysfunction is strongly correlated with the severity of their illness. Neutrophils are the major effector cells of the immune system and the observed mitochondrial dysfunction is bound to have a deleterious effect on this system. We note that increased apoptosis of neutrophils has been observed previously in people with CFS . Mitochondria are important functional parts of almost all human cells but we cannot assert from the present study that the mitochondria in other cells are dysfunctional to the same degree; human biology provides energy to vital organs at the expense of less important parts. However, dysfunction in heart muscle cells and in central nervous system cells could explain respectively the vascular and central sensitization clusters of clinical abnormalities mentioned in the Introduction. 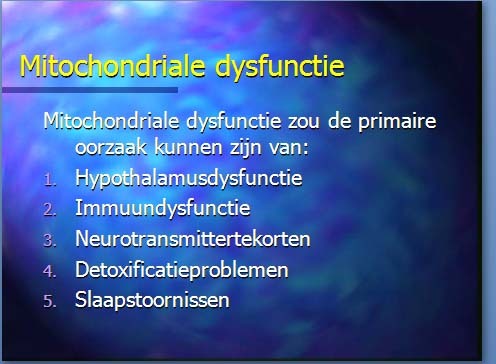 Thus, our results strongly suggest that the immediate cause of the symptoms of CFS/ME is mitochondrial dysfunction. We cannot overemphasize the importance of a careful diagnosis using the CDC criteria , or even better the Canadian criteria which more precisely describe the symptoms . (An abridged version designed for health professionals, patients and carers is available at www.mefmaction.net/Patients/Overviews/tabid/122/Default.aspx). It is doubtful that patient selection with less selective criteria would yield the high degree of correlation observed here. The ways that the individual factors in the Mitochondrial Energy Score behave show that not all patients are affected in the same way. This may be due to the heterogeneous nature of the precipitating agents or to variations in the way patients react to them. The results indicate specific biochemical lesions and some of these may be amenable to ameliorative intervention. Mitochondria need all of their essential vitamins, minerals, essential fatty acids and amino acids to function properly [31-33]. From the clinical point-of-view of helping patients this is very important; the typical time-consuming hit-or-miss protocol can be replaced by interventions based on biochemical information and understanding . An analysis of the outcomes of interventions being carried out (see www.drmyhill.co.uk) will be the subject of a future publication. We have demonstrated the power and usefulness of the “ATP profile” test in confirming and pin-pointing biochemical dysfunctions in people with CFS. Our observations strongly implicate mitochondrial dysfunction as the immediate cause of CFS symptoms. However, we cannot tell whether the damage to mitochondrial function is a primary effect, or a secondary effect to one or more of a number of primary conditions, for example cellular hypoxia , or oxidative stress including excessive peroxynitrite [54-58]. Mitochondrial dysfunction is also associated with several other diseases and this is not surprising in view of the important role of mitochondria in almost every cell of the body, but this fact appears to have been recognised only in recent years [34, 38, 59, 60]. The observations presented here should be confirmed in a properly planned and funded study. 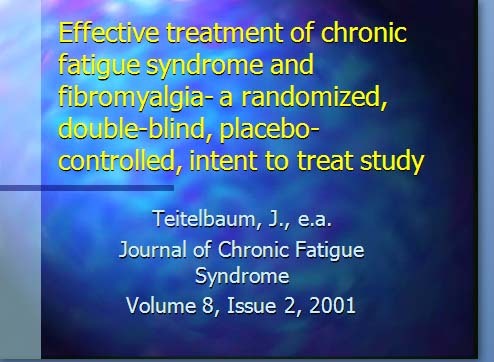 The biochemical tests should be done on CFS patients after, as well as before, appropriate interventions and possibly on patients with other disabling fatigue conditions. It would also be good to confirm the biochemical test results in a second (perhaps government-supported) laboratory. We acknowledge helpful comments from Dr. Derek Pheby and Dr. Neil Abbot. Severe symptoms on a continuous basis; bedridden constantly; unable to care for self. Severe symptoms at rest; bedridden the majority of the time. No travel outside of the house. Marked cognitive symptoms preventing concentration. Moderate to severe symptoms at rest. Unable to perform strenuous activity. Overall activity 30–50% of expected. Unable to leave house except rarely. Confined to bed most of day. Unable to concentrate for more than 1 hour per day. Moderate to severe symptoms at rest. Severe symptoms with any exercise; overall activity level reduced to 50% of expected. Usually confined to house. Unable to perform any strenuous tasks. Able to perform desk work 2–3 hours per day, but requires rest periods. Moderate symptoms at rest. Moderate to severe symptoms with exercise or activity; overall activity level reduced to 50–70% of expected. Able to go out once or twice per week. Unable to perform strenuous duties. Able to work sitting down at home 3–4 hours per day, but requires rest periods. Moderate symptoms at rest. Moderate to severe symptoms with exercise or activity; overall activity level reduced to 70% of expected. Unable to perform strenuous duties, but able to perform light duty or desk work 4–5 hours per day, but requires rest periods. Mild to moderate symptoms at rest. Daily activity limitation clearly noted. Overall functioning 70% to 90%. Unable to work full time in jobs requiring physical labour (including just standing), but able to work full time in light activity (sitting) if hours flexible. Mild symptoms at rest; some daily activity limitation clearly noted. Overall functioning close to 90% of expected except for activities requiring exertion. Able to work full-time with difficulty. Mild symptoms at rest. Symptoms worsened by exertion. Minimal activity restriction noted for activities requiring exertion only. Able to work full time with difficulty in jobs requiring exertion. No symptoms at rest; mild symptoms with activity; normal overall activity level; able to work full-time without difficulty. No symptoms at rest or with exercise; normal overall activity level; able to work or do house/home work full time without difficulty. The “ATP profile” tests were developed and carried out at the Biolab Medical Unit, London, UK (www.biolab.co.uk), where one of us (JMH) was Laboratory Director until retirement in 2007. Blood samples in 3-ml heparin tubes were normally received, tested and processed within 72 hours of venepuncture. We briefly describe here the 3 series of measurements, (A), (B) and (C) and how the 5 numerical factors are calculated. (Step-by-step details can be obtained by contacting JMH at acumenlab@hotmail.co.uk ). Neutrophil cells are separated by Histopaque™ density gradient centrifugation according to Sigma® Procedure No. 1119 (1119.pdf available at www.sigmaaldrich.com). Cell purity is checked using optical microscopy and cell concentration is assessed using an automated cell counter. Quantitative bioluminescent measurement of ATP is made using the Sigma® Adenosine 5′-triphosphate (ATP) Bioluminescent Somatic Cell Assay Kit (FLASC) according to the Sigma® Technical Bulletin No. BSCA-1 (FLASCBUL.pdf). In this method ATP is consumed and light is emitted when firefly luciferase catalyses the oxidation of D-luciferin. The light emitted is proportional to the ATP present, and is measured with a Perkin-Elmer LS 5B Fluorescence Spectrometer equipped with a flow-through micro cell. Sigma® ATP Standard (FLAA.pdf) is used as a control and as an addition-standard for checking recovery. Similar kits are available from other providers, e.g. the ENLITEN™ ATP Assay System (Technical Bulletin at www.promega.com), and dedicated instruments are now available, e.g. Modulus Luminescence Modules (see Application Note www.turnerbiosystems.com/doc/appnotes/PDF/997_9304.pdf). (A). ATP is first measured with excess magnesium added via Sigma® ATP Assay Mix giving result a. This is the first factor, the concentration of ATP in whole cells, ATP = a in units of nmol/106 cells (or fmol/cell). The measurement is repeated with just the endogenous magnesium present by using analogous reagents produced in-house without added magnesium, giving result b in the same units. The ratio, c = b/a, is the second factor, the ATP Ratio.